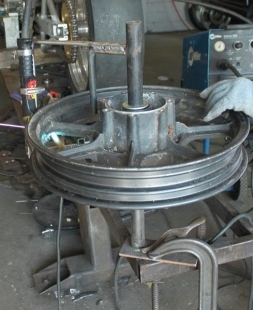 Homemade wheel slicer comprised of a plasma torch fixture and intended to facilitate the process of cutting motorcycle rims. Constructed from channel steel, the wheel rests on a rotating assembly, with the torch secured on the outer edge. Looks rudimentary but in the hands of a skilled operator, this should work well enough.